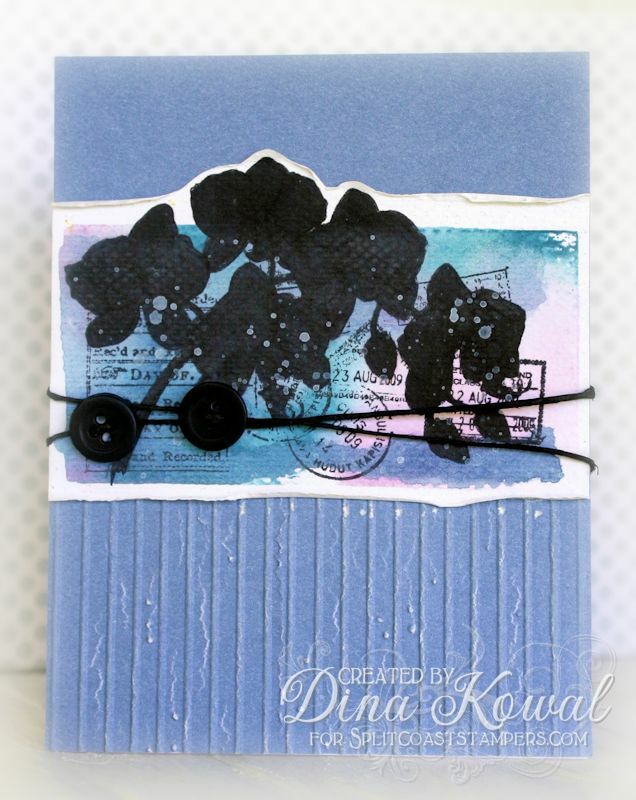 Dina Kowal Creative: Mixed Media Challenge - ACK!! black? Mixed Media Challenge - ACK!! black? It's my turn to host the Mix-Ability challenge over at Splitcoaststampers! I love the chance to host, encourage, and teach a few new tricks for working out mixed media in each participant's own style. 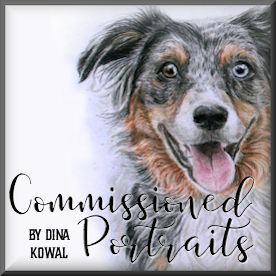 It's so easy to think that all mixed media work has to be grungy and messy - and then get frustrated when that style doesn't express our normal artistic idiom. I kept my cards clean and simple, just for that reason! This week I've challenged our participants to use BLACK to shade their colored images. I don't usually go for such deep contrasts, so this stretched me a little too. I put together a little video showing 3 different ways to do this, with a few tips and tricks along the way. 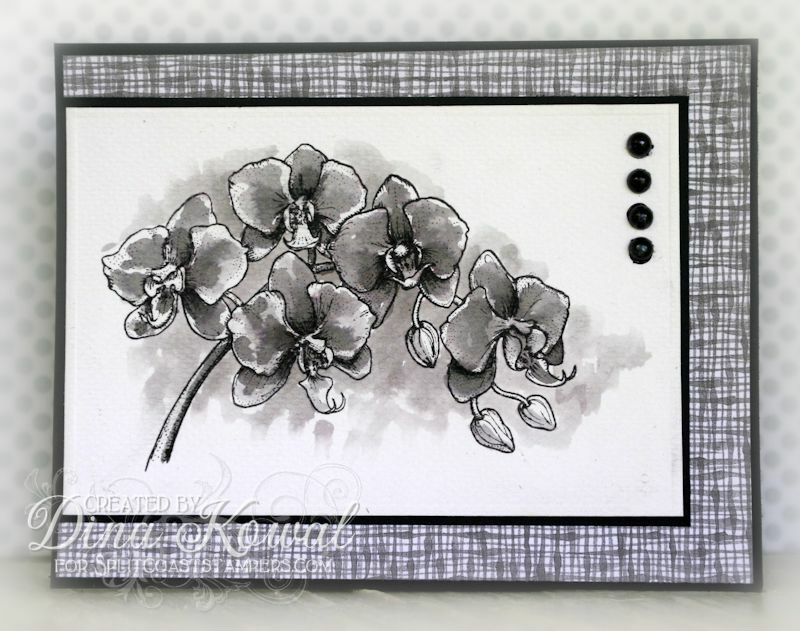 I used the same Orchids image from Flourishes on all 3 cards. My first card was watercolored using black dye ink from Ranger, and a waterbrush... I did darken a few of the deepest shadows with a pencil after making the video. For the last card, I made a block print using an acrylic block and misted chalk inks. The image was colored in with a Touch marker (120 Black), stamped over the top, then splattered with white acrylic paint. I put the lower half of the card base into an embossing folder, and parts of it split and cracked - I thought that was sort of cool, so I left it that way! Wonderful tutorial, Dina! Thank you! I absolutely adore that drywall mesh stippling technique you did, and I was wondering how to do it. Thanks for such a clear and lovely tutorial! I love your grey tone card. In fact, it's one of my favorite ways to color. 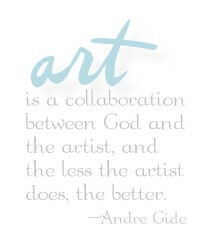 I wish more people would embrace it. Always a treat to see your work.